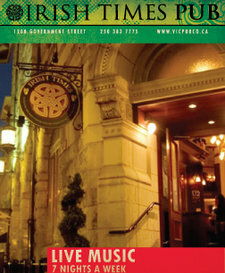 Located at 1200 Government Street, the Irish Times Pub is home to 190 seats over two floors with 80 seats available on our patios, opening onto both Government Street and historic Bastion Square. Our concept goes far beyond mere architecture though. The Irish Times opened with everything it takes to make a pub successfully Irish, including authentic Live Irish music, 7 nights each week. The tradition of Ireland has also been extended to our menu, which has been developed on a philosophy of creating traditional Irish food and drink that is both contemporary and funky, showcasing Irish Pub Food as you would see in Ireland today.